It’s impossible for me to revisit the Columbia River without reliving the past. Although I only lived there for a year, from 4 to 5 years old, some of my oldest memories come from that period; most of what precedes that time is only a blur. Goldendale was also my maternal grandfather’s home; he lived on a ranch, broke horses, and drove cattle to market across the Columbia River. I attended my first rodeo there and can still remember seeing Brahma bull riders and Indians dressed in their best finery. Although I wasn’t aware of it as a child, the area was an important one to the Indians and still is as the Yakima Indian Reservation has to be one of the largest in Washington State. Of course, it wasn’t until this trip that I learned how important salmon fishing was to the natives, that there was a wide-spread economy based on the trading of dried salmon. Ironically, though, the Old-West memories on this trip were triggered by the sight of a Buffalo herd alongside the road even more so than seeing the Indian fish camps earlier. I couldn’t resist stopping and getting a shot, even though I’m pretty sure that Buffalo were never native to this area, though they certainly seem better suited to the area than cattle. Weather in the eastern part of the Columbia Gorge is brutal, particularly in the winter when high winds and bitter cold often join together to make life difficult for those willing to live there. After seeing the buffalo I decided it must be time to put on R. Carlos Nakai’s Canyon Trilogy. “Dawn’s Mirage: Ancestral Home” seemed like an appropriate accompaniment to my journey. I’m pretty sure that if Buffalo were indigenous here they would have shown up in the petroglyphs along with the goat, deer, and elk. Of course, that line of thinking would seem to indicate that salmon should also appear in the petroglyphs and they don’t, at least not in the ones I’ve had the privilege to view. Wonder why? It’s certainly an important part of Coastal Indian art. 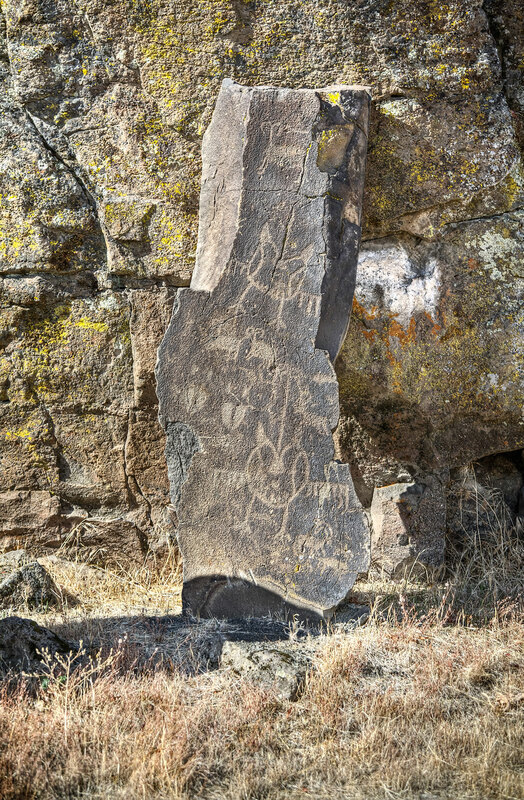 Did I mention that I stopped again to see the petroglyphs at Horsethief Butte? Very hard to resist that temptation when you’re thinking about Columbia River Indians. I find these enigmatic figures irresistible and I seem to learn something new every time I study them. I’ve always thought the figures with “horns” were a demonic figure, but when a reporter suggested that there were owl figures, it just took one look at the feet to realize that he was probably right. However, this figure which has somewhat similar ears still looks demonic to me. What do you think? 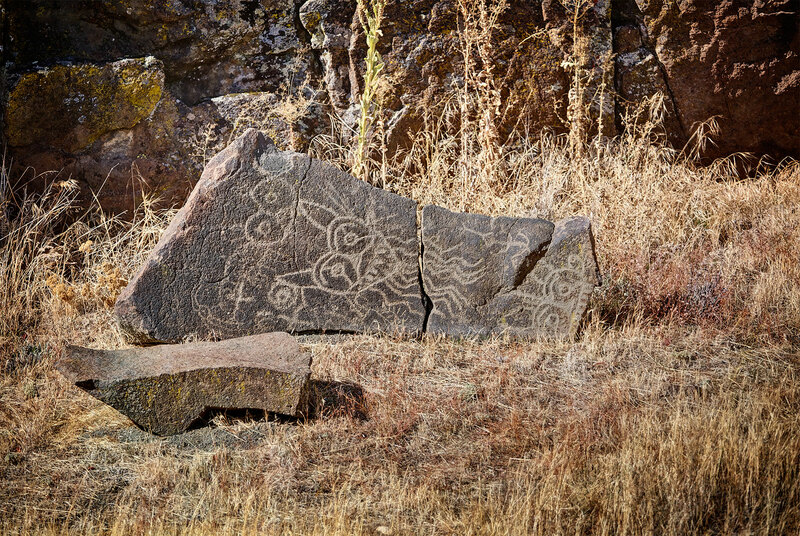 In reality it seems to be all speculation because there’s little consensus on how old the petroglyphs are, much less what the symbols represent. 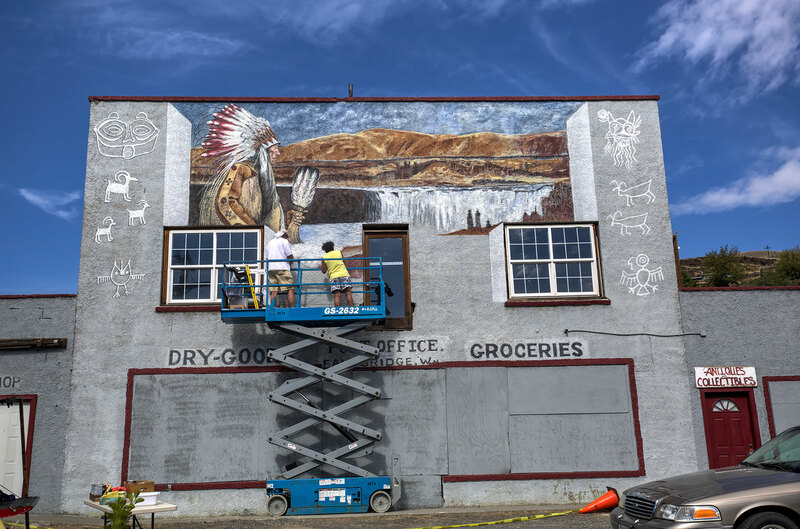 Coincidentally, a little further up the river I stopped to see a “historic train” and discovered these local artists painting a mural using symbols taken from the petroglyph. 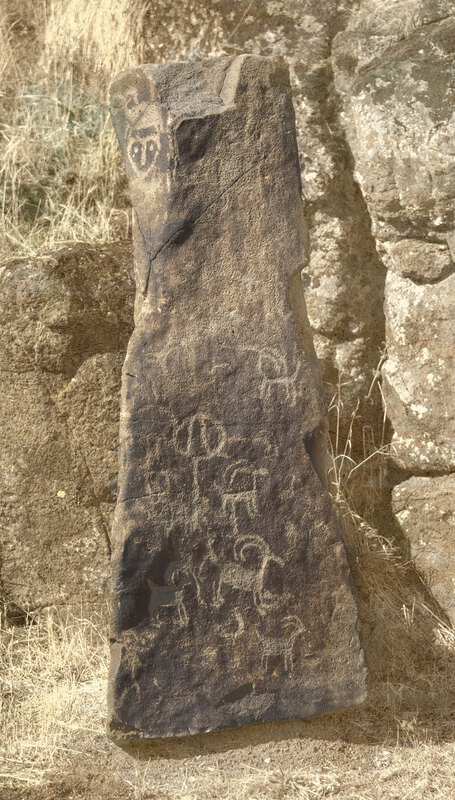 What I did learn from talking to the artists is that I have managed to miss the most famous petroglyph at the site, the one in the upper left hand corner. It’s located behind the area that has been roped off to prevent vandalism. It’s clear that I’m going to have to call and sign up for one of their scheduled walks in the restricted area next Spring, since there are none scheduled in the late fall and winter. Is this in Washington state? Yes,on the Washington side of the Columbia River, close to Briggs Junction. I had no idea. I’ve always pictured the entire Columbia River valley as lush and green, like the terrain I would see in the early X-Files episodes. Nope, most of Eastern Washington is high desert. You’d have to ask Doug Alder, but I think it’s also that way in much of Canada. Funny, I was just thinking the same thing, Harry, while editing recent pictures of Mt. Rainier for a future post.